Photo 5/7/2000 John A. Bullock III. 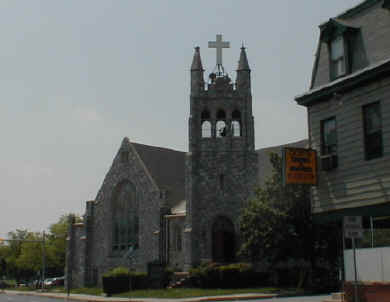 This congregation moved in 1996 to the building which formerly housed the Providence Avenue Methodist Church. Former Pastors The first pastor appointed by the conference was Rev. Henry Davis in 1849. Rev. Adam Driver was appointed May, 1856; was taken sick and died during the fall. Rev. Jeremiah Young was appointed May, 1866-1867. During this term the church was rebuilt. Rev. William H. Bryant was appointed May, 1886-87-88-90. During his pastorate a lot was purchased at Concord avenue and Patterson streets, and the new church was erected. Church History The following brief History of Asbury A.M.E. Church is taken from the Home Directory of the Colored People of Chester, 1906 compiled by Lawrence L. Barrett & C. I. Wilson. This reference is available at the DCHS research library. This church was organized by Rev. Stephen Smith, of Philadelphia, in the year 1845. On October 26th of the same year, the church property was purchased from the M. E. Church, now known as the Madison Street Church, at a cost of $700, on East Second street, near Market. On November 12th of the same year the first payment was made of $150. The deed was made in trust to Stephen Smith, David Wilson, Thomas Lytle, Nicholas Murphy and James Campbell. The first leader was Thomas Lancaster, the class being composed of four persons, viz: Ann Murphy, Priscilla Wilson, Henrietta Ross (who was a member of the M. E. Church, but remained with the new organization) and Brother Lancaster, the leader. This class first met and organized in the house of Nicolas Murphy, the husband of Ann Murphy. His brother, William Murphy, came here with his wife, Harriet, in 1846, bringing their certificate from Bethel Church, Baltimore, MD. The same year he was licensed to exhort and was given the charge in the absence of the Rev. Stephen Smith. He was also made a class leader, and after two years was licensed to preach. In 1858 was ordained deacon, which office he held with honor and credit until his death. He was also the originator and prime mover of the A. M. E. Church in the western part of this city, known as Murphy's Chapel. TRUSTEES- Joseph Barrett, Charles Watts, Cyrus Griffin, Henry Robinson, Samuel Anderson, Ross Holland, Greensbury Morris. STEWARDS- George Green, William Gardner, Joseph Barrett, William Daniels, Shephard Blackson, George Baker, Charles Barrett. STEWARDESSES- Mrs. Margaret Buck, Mrs. Mary Morris, Mrs. Maria Tilghman, Mrs. Henrietta Barrett, Mrs. Rachel Barrett, Mrs. Emma Watts, Mrs. Cassie Brown, Miss Jane Rowlins, Mrs. Mary Jay. TRUSTEES' AIDS- Mrs. Hannah Showell, Mrs. Fannie White, Mrs. Mary Lytle, Mrs. Lavinia Purnsley, Mrs. Mary Parker, Mrs. Rebecca Smith, Mrs. Mary Spencer, Mrs. Jemima Taylor, Mrs. Maggie Downs, Mrs. Mary Deen. PARSONAGE COMMITTEE- Mrs. Stella Showell, Mrs. Annie Lytle, Mrs. Lizzie Simmons, Mrs. Maggie Showell, Mrs. Mary Horsey, Mrs. Laura Ryans, Mrs. Alice Quarles, Mrs. Florence Milbourn. © 2000, 2001, 2003 John A. Bullock III.